Updated at 5:36 p.m. on January 21, 2016. Standing before a joint assembly of the House and Senate to deliver his final state budget address, Gov. Peter Shumlin offered a $5.81 billion spending plan that neither launched the bold initiatives nor made the dramatic cuts of past years. Shumlin led off with a reminder that despite the revenue challenges he has faced throughout his years as governor, “This will be my sixth budget that does not increase income, sales or room and meals tax rates.” But he is relying on some new revenues from a health provider tax expansion and a mutual fund fee increase. The governor said he was proud that the budget increased general fund spending “by a modest 3.1 percent, which is matched by an identical projected increase in revenues." 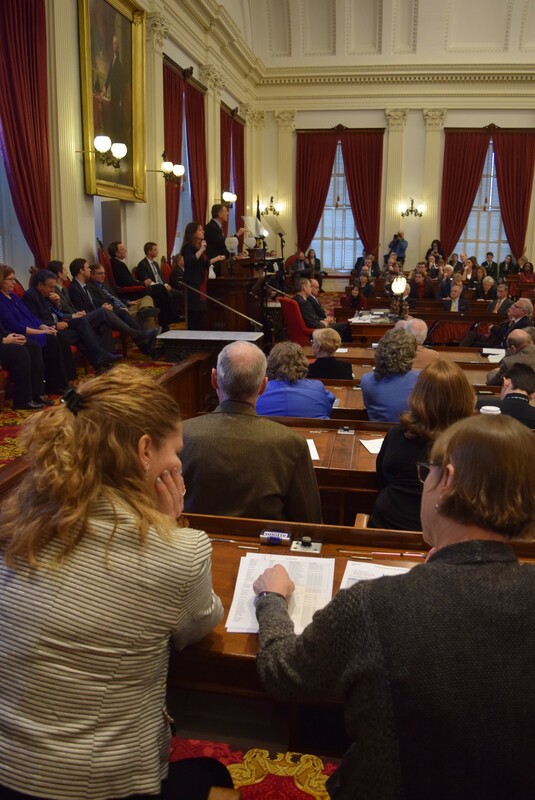 Shumlin used his final budget address to lecture lawmakers about past failures to address the state's Medicaid funding challenges. He noted that last year, the legislature rejected what he called his “modest payroll tax,” a funding remedy that he said would have eliminated most of the $55 million shortfall in Medicaid funding he faced in this budget. “While it is easy to criticize a budget, and I know some of you will, it’s difficult to make the tough choices involved in crafting a responsible one,” Shumlin said. At a news conference immediately after the governor’s speech, House Minority Leader Don Turner (R-Milton) credited Shumlin for having a lower budget increase than in recent years, but said that wasn’t sufficient. What else would he cut? Turner said Republican House members are working on that. Democrats generally supported Shumlin’s plan, though House Speaker Shap Smith (D-Morristown) noted he had yet to see details about the proposals. To plug the $55 million Medicaid hole, Shumlin called for two new revenue sources. He proposed requiring doctors who aren't affiliated with hospitals and all dentists to pay a 2.35 percent provider tax. Hospitals, doctors connected with hospitals and nursing homes already pay pay 6 percent. Taxing the independent doctors and dentists would generate $17 million and allow the state to draw down an additional $20 million in federal dollars. "This legislature has a wicked addiction of its own," said Senate Minority Leader Joe Benning (R-Caledonia), criticizing Shumlin's proposed provider tax. "Enslavement to federal funding." To offset some of the new expense, said Justin Johnson, secretary of administration, independent doctors and dentists would see an increase in the rate the state pays them when they treat Medicaid patients. Another part of the remedy for the Medicaid shortfall is the proposed doubling of the $600 fee that mutual funds pay the state, to $1,200. “Vermont currently charges the lowest mutual fund registration fee in New England,” Shumlin said, adding, “Did you know that?” The increase would bring Vermont's charge more in line with other states' fees and would raise $13 million. To drive home his point about the continued need for health reforms, the governor went off-script for five minutes with the story about what happened after his father had a car accident. In his trademark folksy style, Shumlin recounted the over-the-top care his father was offered despite walking away from the crash with just scratches. Shumlin asked lawmakers to guess how much the emergency room visit had cost. No one hit the number, which Shumlin said was $68,000. Benning slammed Shumlin for asking the audience to guess how much his father's hospital visit cost. "I don't think it should be anybody's prerogative to stand at the podium and act like Bob Barker on the 'Price is Right,'" he said. Smith, by contrast, praised Shumlin for the story. “It was using a real story to highlight the frustrations people have,” Smith said, noting he paid bills for his wife’s cancer treatment without fully understanding them. The governor returned to his prepared remarks to pitch his administration’s current reform initiative — a plan that would move health care from fee-for-service to an outcome-based payment model. The state is negotiating with the federal government to allow this system, he said. The budget also allocates $1 million for the Step Up program that the governor wants to offer to pay for a semester of college to encourage more low-income Vermonters to try higher education, or to return to school if they had previously dropped out. The budget requires the University of Vermont, the state colleges and the student loan corporation to live with the same dollars they received in the current budget. Johnson defended the decision saying, "Most of state government is level-funded." The governor is putting some ideas on the table that lawmakers have considered before, such as a proposal to scale back the high school program offered to prison inmates. Finance Commissioner Andrew Pallito said this year's recommended cut is smaller than one proposed last year, because it calls only for closing sites outside of the prisons. It would save $700,000. The budget also calls for closing the 112-bed inmate work camp in St. Johnsbury, to save $1.1 million. Pallito said the correctional system is getting far fewer people eligible for its work camps. The 110-bed camp in Windsor will keep operating. Democratic House leaders indicated Shumlin’s plan to close the St. Johnsbury work camp likely makes sense, but Republicans were more wary. “The last place we should be shutting down … is a work camp,” said Rep. Janssen Wilhoit (R-St. Johnsbury), though he didn’t know the facility was at half-capacity. Steve Howard, executive director of the Vermont State Employees Association, said the union would fight closing the camp, which employs about 20. Corrections Commissioner Lisa Menard said employees would be offered vacant positions at other prisons, which are frequently available. The governor also wants lawmakers to revisit the controversial law governing when mentally ill patients can be medicated against their will. The legislature rewrote this law several years go, drawing patients and parents to emotional hearings. The budget suggests $5 million could be saved if the involuntary medication process moves faster, because patients wouldn't spend days or even weeks in legal limbo in hospitals — sometimes with a sheriff's deputy or security guard hired to watch them. "I know there is a lot of passion around this," Johnson acknowledged during a budget briefing for reporters. "Irrespective of the money, it is important to get through the process quicker." The administration predicts $3.4 million in Medicaid savings as a result of reviewing the eligibility of all current participants. The administration expects to save $4.9 million by changing the income threshold for pregnant women to qualify for Medicaid. Currently, they qualify if their incomes are 213 percent of the federal poverty level. The budget would reduce that to 138 percent of the poverty level. The budget anticipates $4.7 million in savings from another pregnancy related program — long-acting, reversible contraception. The Medicaid program would begin offering contraception to mothers immediately after they give birth — before they leave the hospital. The goal is to reduce the number of unintended pregnancies. In response to the killing of a state social worker last summer, the budget includes $2 million to increase security in state buildings. The budget also covers 35 additional staff at the Department for Children and Families and new legal staff elsewhere — all to respond to the increase in DCF's caseload. And the budget continues the governor's efforts to battle opiate addiction, by adding a new treatment facility in northwestern Vermont and expanding the needle-exchange program. 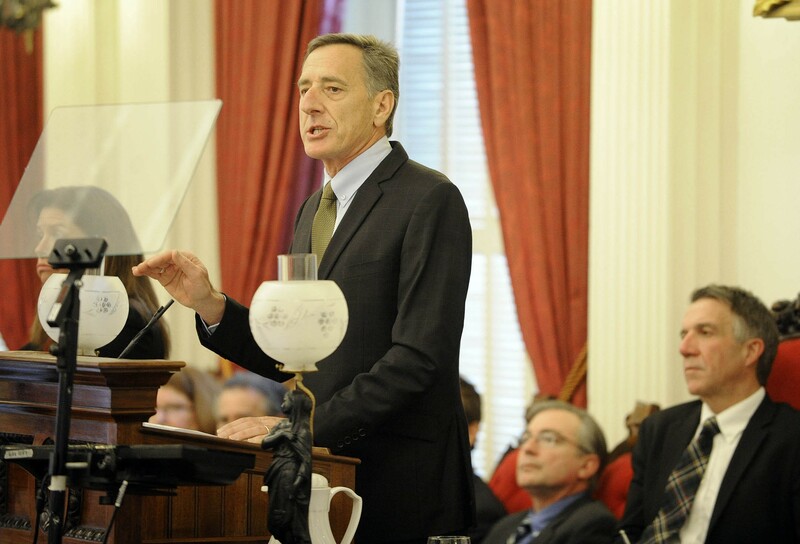 Shumlin also proposed addressing something “too often kept as a family secret” — suicide. He would double the $100,000 funding for the Vermont Suicide Prevention Center.